Nomusa Dube-Ncube has been the hands-on MEC for Cooperative Governance and Traditional Affairs in the KZN Legislature since 2009 where she continues to add value to political leadership with her fair and firm style. KwaMashu-born political and community activist MEC Nomusa Dube-Ncube has been in the frontline of resistance politics and community mobilisation in the collective quest for a non-racial, non-sexist and democratic South Africa. She has stayed the course and continues to hold her position as one of the senior leaders of the African National Congress in her home province of KwaZulu-Natal. At the start of South Africa's democracy in the 1990s, MEC Nomusa Dube-Ncube served the Mayor of the North Central Local Council before the local authority of Durban was amalgamated with several others to form what is now known as the eThekwini Municipality. Subsequently, MEC Nomusa Dube-Ncube was appointed the Speaker of the eThekwini Municipality. She also presided over the 1500 member negotiating team that discussed the transformation of local government whilst National Government was discussing South Africa’s broader transformation. This was a crucial process leading up to the formulation of the sphere of local government as we have it now. Her work in local government did not stop there; she co-chaired the Interim Local Government SETA at its establishment and was the Deputy Secretary of the South African Local Government Association (SALGA) at national level. She was also part of the sub-committee that drafted the White Paper on Local Government that gave rise to the Municipal Structures Act, Municipal Structures and Systems Act, Municipal Finance Management Act and many other key pieces of local government legislation. Her experience in local government is indeed vast, spanning over 20 years. Within the ANC, MEC Nomusa Dube-Ncube has served as Treasurer and Deputy Secretary of the eThekwini Region. After a remarkable term as the Speaker, during which period MEC Nomusa Dube-Ncube championed women’s and youth development and a number of other initiatives aimed at alleviating poverty, creating jobs and promoting social cohesion, the ruling ANC redeployed Nomusa Dube-Ncube to serve as Ambassador to the Czech Republic where she worked tirelessly promoting the new South Africa and attracting foreign investment, boosting tourism in KwaZulu-Natal and other parts of the country and hosting numerous trade delegations. 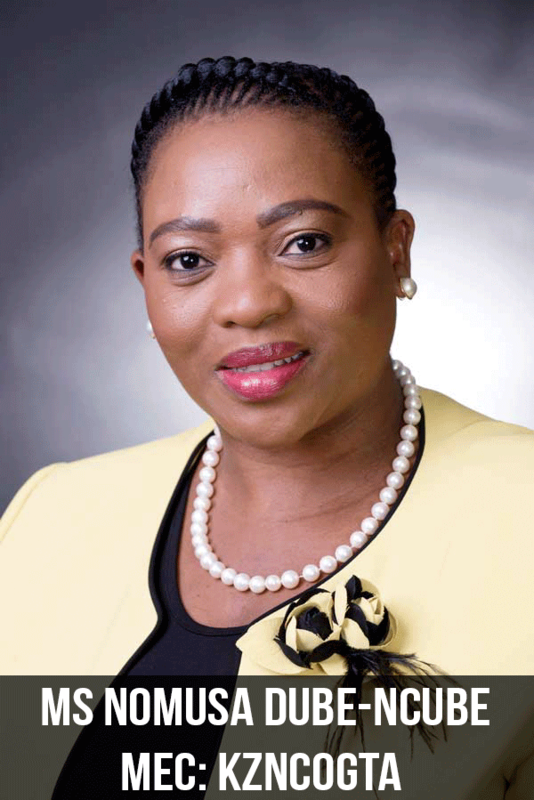 Thereafter, MEC Nomusa Dube-Ncube was appointed back home to serve as the Chief Whip of the African National Congress in the KwaZulu-Natal Provincial Legislature. Parallel to that, MEC Nomusa Dube-Ncube was appointed as the Deputy Provincial Secretary of the African National Congress in KwaZulu-Natal, and in 2009 was promoted to the province’s Executive Council. Subsequent to that she was appointed Treasurer of the ANC in KZN 2015 and re-elected in 2018. MEC Dube-Ncube’s focus is sharply on service delivery in the rural and far-flung areas of a very vast and challenging province defined by rampant poverty, unemployment and a lack of opportunities for rural women and aspiring young women who have been denied proper education. MEC Dube-Ncube has successfully straddled all challenges in her department, making strident calls for clean audits among municipalities, promoting good governance and transparency while encouraging senior managers and public servants to fulfil their academic potential and contribute to our knowledge economy by furthering their post-graduate studies at universities.